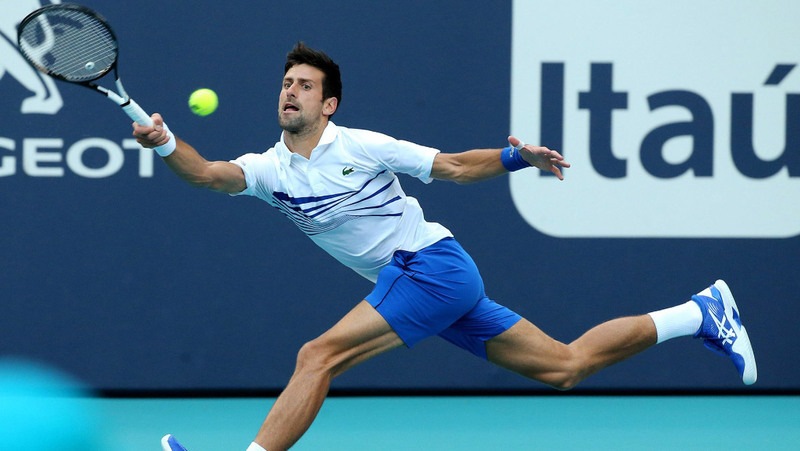 Six-time champion Novak Djokovic battled into the fourth round of the Miami Open presented by Itau at Hard Rock Stadium on Sunday, defeating world no.83 Federico Delbonis 7-5, 4-6, 6-1 in two hours. Djokovic appeared in control early on, racing into a 5-2 lead in the opening set. Delbonis roared back to level at 5-all, but the 31-year-old Serb staged a timely comeback, with another break proving crucial. Novak stormed again into a 3-1 lead in the second set, but then lost four straight games, following another spirited fightback from the Argentine. Delbonis saved three break points in the eighth game and served out the set to love two games later. For the third time, Djokovic took a 3-1 advantage in the third set. This time the world no.1 made no mistake. He moved 5-1 in front and proceeded to serve out the match. Match statistics: aces (3-8), double faults (3-5), winners (12-31), unforced errors (19-39), total points won (89-72). For a place in the ATP Masters 1000 event quarter-finals, Novak will play 22nd seed Roberto Bautista Agut who defeated no.15 seed Fabio Fognini in straight sets 6-4, 6-4. Djokovic leads their FedEx ATP Head2Head series 7-2, but the Spaniard won their last meeting in 2019 Doha semi-finals. The top seed shares the record for most Miami titles won (6) with Andre Agassi, and has a chance to take it over with a seventh crown.